The Internet of Things (IoT) is changing our world, including our development and strategies for buildings, equipment, devices and applications. IoT is contributing to a significant shift in the way people acquire information, interact with each other, and make decisions. It is enabling us to expand our reach to a range of devices that can gather and analyze physical data and react to that data in a variety of applications that we’ve never seen before. 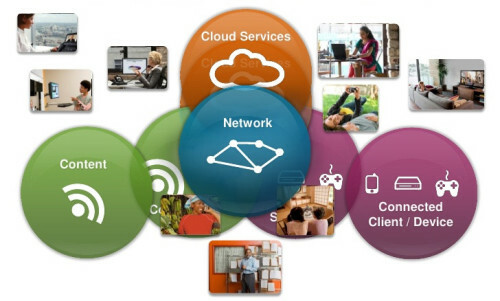 The Internet of Things is enabling us to move from connected devices to connected intelligence; it is allowing us to redistribute and process data independently at the edge device level and within the Cloud enabling real-time decision making at the network edge. Specifically built for today’s IoT environment, E2E provides all the backend services needed to create valuable business applications. With a focus on performance and reliability, E2E is specifically designed and engineered for the most demanding enterprise solutions. E2E consist of an IP protocol Stack, core building blocks, hardware, applications, connection options and Cloud Services based on an open source software operating system environment and supported by a family of secured, open, embedded hardware and gateways. E2E delivers a robust ecosystem for edge computing capabilities via a single, portable control platform and supports a variety of applications for all types of equipment and devices and the flexibility of open source with additional value strengths including common APIs, development tools, open source access and open hardware platforms and a development ecosystem.